Forums > Help > Group Design Option? I dont know whether it's an epic membership thing or CSS. Can someone help before it drives me crazy? How to do... what? Add navigation? Center it? Make it appear separate from the rest of the page? Change the font? You need to be a little more clear. I dunno what you'd call it. Make it separate from the page, and centered. I might be simply overlooking something, but I couldn't see any options to do so anywhere. 'If you know how to write CSS, you can create up to 5 ultra-custom looks for your group. 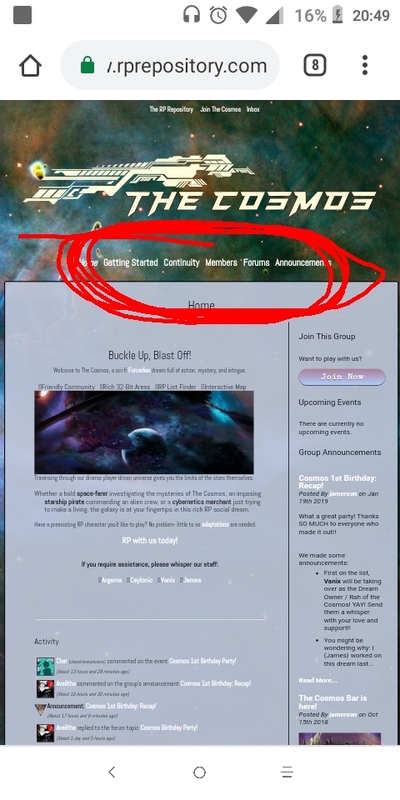 So basically that group is an epic group that created a template for the group that puts the page links in the middle. Epic-groups are separate from epic members, you have to pay for your group to be an epic group even if you've already paid for epic membership for yourself. Ah, okay, thank you! My group does actually have an epic status but I've got no clue how to write CSS. Fun.